I am certain this has been asked and answered somewhere, I just can not find it. Is the Haiku available with a Red LED? I have some red Dragon LED's I have built Mules and SunDrops with but I don't have any red Cree LED's. The Dragon might work with the XM-L reflector in the Haiku but I have never tried the combo. Haiku owner checking in, I LOVE my Haiku! My only regret was not getting one sooner, but better late than never. I've owned quite a few very impressive custom flashlights, but none have earned the attachment I feel towards my Haiku! My first baby was an XML, then soon after came an XPG. Why? Because I could, so I did! UPDATE: I now have the trifecta with an XRE model too! Now, which one to sell....if any....? They seem so happy together! Last edited by jkid1911; 08-17-2015 at 07:31 PM. My new Haiku with a little SF bling! Haiku, I need to have you. Awesome. The Haiku has got to be one of the most useful and desirable little lights ever made, well I think so anyway. I've got two, one with a 119V and the other with a home made XPG2/GDuP combination. My suggestion would be to modify your XPG to a 119(V) or 219 Nichia. If you're handy with a soldering iron you could remove the MCPCB and remove the XPG and flow a 219 on the same board for a cheap and worthy upgrade then you'd have pretty well every flavour of Haiku made to date. Ted, good one, love it. Once in a big hotel, nice one, The Waldorf, what ever, where people are educated, I yelled getting on the elevator to my wife, "Where is my haiku!?" A nice lady who looked like she just came from Bergdorf's said 'Oh my boy, there is a slip of paper, could that be it, and when I explained it was a flashlight, well I was a person to be ignored. Very funny. Turns out it was in a different pocket and I tried to explain the exclusivity of the piece, I could have said HRH Prince Charles gave it to me, and it would have made no difference. Once I was not of literary standing I was out of the club. Of course I yell where's my Haiku a few times a week, but no one knows what the hell a real haiku is, so it goes un-noticed. The XRE will throw the furthest but is the least bright of them all. The XPG2 is the best lumen:throw ratio that Don offers currently IMHO. Not sure as I am no expert but, an answer from one of the real McGiz experts, I would say your XRE. But again I can't say for certain, as I'm not the expert here on these wonderful lights I learn every time I come here because this is a great hobby. If you feel you have a problem, I have a Red LED Haiku, and a Red LED SunDrop, I call the "Setting Sun Drop" others call it the "Mars!" You don't have a problem, these are nice things and rare, how many people have something like these. What others do you have, I wager it does not stop at Haikus. So give us your rundown. I have a Red Sun Drop I call the "Setting Sun Drop!" Some here like to call it the "Mars", I have a mule 119, Sapphire, a VME titanium head with a Malkoff M31, and a MC Cree Mc Lux III Ti XR19 PDS, and a Makai XPG2 with a 2 AA clicky Pack, and an XPG 1 Haiku. That is my collection to date, modest compared to some around here! I not sure but, that seems to be a good all round head for the UV, however input is very much welcome here. Thanks and you are fine, in the scheme of thing this is an inexpensive hobby compared to golf, or custom knives which is a total let done for me. I have like a couple of dozen or more beautifully made knives, mostly from the 90s, and they are something. 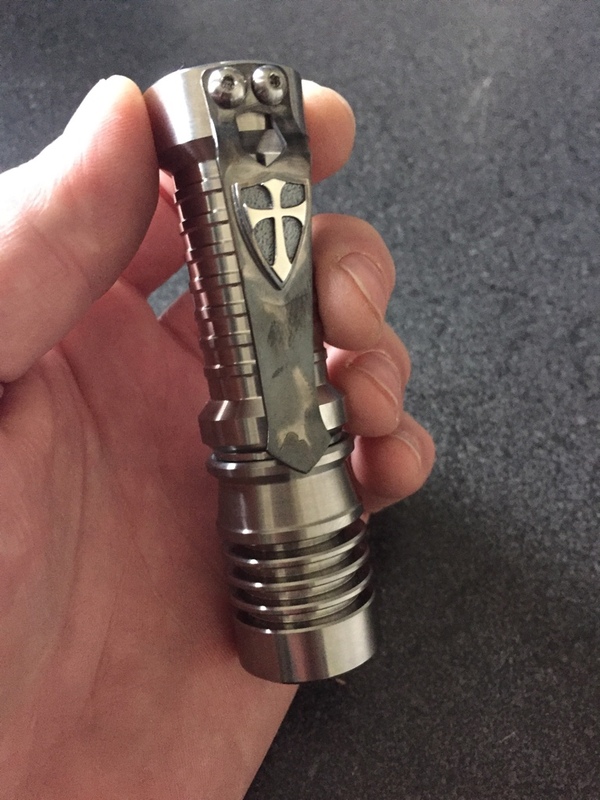 I like them and carry knives daily, but flashlights are more fun. Pre 911, I think the best knives were produced. I also have have motorcycles but, they are worth the cost, and I have sport bikes...speed man! Where Don makes these lights there are more than 700 turns to, the road to Hana, and it seems like that to the top of Haleakala. Every one needs to go up there once in their life. Last edited by RedLed; 10-27-2015 at 04:11 AM. LOL, not sure if i should report this post. What? That's how I carry all my Gizmos. Any other meaning you may have inferred just tells you something about the state of your own mind. Think of it as a poetic Rorschach blot. I've been thinking about it but this post has probably pushed me there. When I get some time I'll find a proper 660nm red LED, probably an XPE, and I'll pry the MCPCB with an XPL that I'm not big on out of another LE I built and do the swap. A deep red Haiku and Sundrop, the Mule too, will be awesome. I use a red light engine more often in the Mule bezel, and then the SunDrop, than the Haiku ... but it is useful, for sure.